И кстати, еесть очень хорошая новость!.. We have already recorded a new album. We are waiting for a new record company to put it out. I hope it will be out by the summer time. I will let you know. Андрей, так пойдёт появление для тебя?.. О прослушанном можно сюда же отписаться? А то с МэйлРу не всегда скачается с хохляндских провайдеров. Originally formed as a five-piece in 1986, POTENTIAL THREAT SF has shared the stage with everyone from TESTAMENT to SLAYER to CRO-MAGS to NUCLEAR ASSAULT, and just recently returned from touring with DEATH ANGEL. Their hard-working, no-holds-barred attitude carries over to their live shows. Though they put every ounce of grit and determination into their set, they still manage not to sound like angry old fucks. Their mentality is simple — it's just as easy for a band to get the audience involved in their show as it is to be pissed off and push them away. In short, they still have fun and show it on stage and to the fans, regardless of how long they've been playing or how many people are in the attendance. 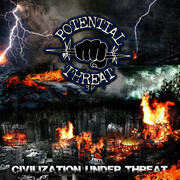 POTENTIAL THREAT SF consists of Mike Noble on lead vocals and lead/rhythm guitar, Daniel Sheridan on lead/rhythm guitar, Kenny Noble on drums and Damien Sisson (also in DEATH ANGEL) on bass. ну и технически ребяты всё ж весьма простецкие, как навоз конский (кизяк) на обочине. Без мух ваще. Серёг, где таких вокалистов "занятых" находишь?..